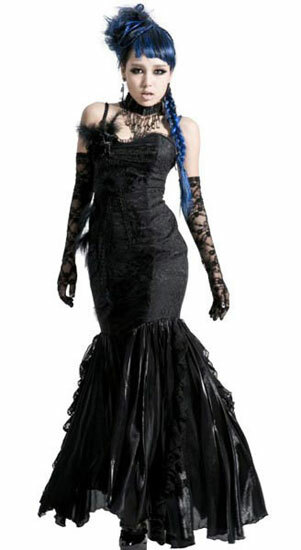 This beautiful black Gothic dress is truly stunning. The front of this dress is adorned with black feathers and has black roses on the right bust. It comes with removable shoulder straps so the dress may be worn strapless. The back of the dress has a V cut with lacing. My daughter looked everywhere for a prom dress. She loves her dress. It arrived on time and in beautiful condition. Thank you so much.